Nuacht Eile / Other News: Rinne Josh Ó Deasúnaigh ó Rang 6 'Run in the Dark' i gCorcaigh aréir! Rinne Josh Ó Deasúnaigh ó Rang 6 'Run in the Dark' i gCorcaigh aréir! Chuaigh Josh ag "Rith sa Dorchadas" aréir agus bhí sé mar dhuine den céad céad críochnaitheoirí chomh maith! Thiomsaigh siad airgead don Charthanacht Mark Pollock. Maith thú Josh! Táimíd go léir an-bhródúil asat! 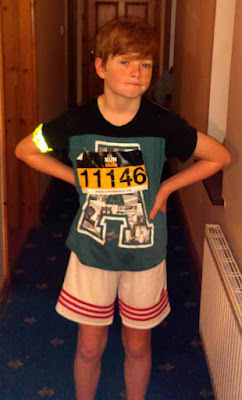 Josh did the 'Run in the Dark' last night in Cork and he finished among the 1st 100 finishers! Raising funds for the Mark Pollock Trust. Well done Josh ! We are all very proud of you!. Ellen from Rang 6 in the Toy Show Friday night!